A stress echo (treadmill) is a combination of an echocardiogram and a treadmill exercise stress test. This test compares how your heart muscle contracts at rest and then immediately following exercise. It can show if certain areas of the heart muscle are not getting enough oxygen-rich blood, as well as identify cardiac causes of breathlessness and blackouts. A limited baseline echo cardiogram (cardiac ultrasound) is performed with the focus on cardiac function and cardiac problems which can contribute to breathlessness (eg valvular problems, build up of pressure within the heart). 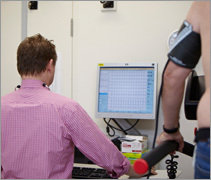 A treadmill exercise stress test is then performed under direct supervision of a Cardiologist. ECG electrodes are attached across your chest to monitor your heart throughout the test. 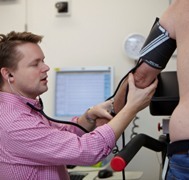 A blood pressure cuff is applied to your arm to monitor your blood pressure. The treadmill test starts slow and increases in incline and speed every 3 minutes. The exercise is generally patient symptom limited, which means we will continue to make the stress harder until you decide you need to stop, which is usually because of shortness of breath or leg ache. A stress test is the safest environment to push yourself physically as you are closely monitored under the supervision of a very experienced cardiologist. When you say so, the treadmill is stopped and you move quickly over to the bed. Immediately after exercise more echo images of the heart are rapidly acquired over 60-90 seconds. You will then be monitored in a recovery phase for ~ 5 minutes. Eat a light breakfast or lunch. Bring or wear loose-fitting clothing and comfortable walking or jogging shoes. read the list from Melbourne Heart care to know if you need to discontinue medication prior to the test. Sometimes your doctor will specifically want to stress your heart on medications.